N.B. Since this article first appeared, the house of Cálem has changed ownership and is now part of a Portuguese group called Sogevinus, which also owns Burmeister and Kopke. The road from the banks of the slow-moving Douro up to the whitewashed walls of the Quinta do Pégo is deeply rutted; strewn with boulders the size of your fist and throwing up clouds of red dust with every footstep. This is late September, and the temperature still hovers around 30 degrees celsius as the last few tractor loads of small, intense purple grapes bump and shake their way past me down impossibly steep slopes. I hitch a lift on the back of a tractor heading back up the hill and grip the sides for dear life as it twists and bucks like particularly bad-tempered bronco. Welcome to the Douro, a land of baking heat, vineyard slopes that resemble cliff-faces, and the grapes for one of the world’s greatest wine treasures: Port. I had been invited to Portugal by one of the most illustrious Port shippers, Cálem. Cálem has the distinction of being one of the few Port houses that are family-owned, and what is more, Portuguese family-owned. As in Bordeaux, most Port businesses are now in corporate hands. Cálem was founded one and a half centuries ago, and has passed through successive generations of the Cálem dynasty. In 1998, without an obvious successor in the family, the good doctor Joaquim Cálem took the decision to sell. Rogério Silva had been director of rival Port shipping company Rozes for 19 years and was a Port man through and through. When Cálem came on to the market he barely hesitated before taking the plunge and buying. Perhaps the opportunity to purchase a piece of posterity for himself, his wife and his young family proved irresistible to Rogério, but clearly there was also a hard-headed business sense and a real passion behind the decision. Cálem is a venerable house and one of the most enduringly popular in Portugal. Rogério himself is wiry, fit as a fiddle and sharp as a tack. He combines an ever-alert, bird-like awareness with a relaxed, soft-spoken authority. He is also a real stickler for detail as was proved time and time again during this visit. He continually coaxed and encouraged his workers to correct and refine precise points of the operation. At harvest time in particular, he is very hands-on. He knows all of his workers and farmers personally and busies back and forth from the grape receiving station to the fermentation tanks, crossing t’s and dotting i’s as he goes. When Rogério took over the famous house of Cálem it had, in truth, been treading a rather middle-of-the-road path. 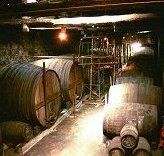 The house is renowned for the quality of its aged tawnies and colheita Ports (aged tawnies of a single vintage year). It is also famed for the quality and popularity of its basic “Velhotes” range, but the vintage Ports of Cálem – the standard bearers for any Port shipper – somehow failed to excite during the 80’s and early 90’s. Cálem is a large producer, with a huge share of the Portuguese and French markets. It has wonderfully situated class “A” vineyards in the highest quality Cima Corgo region (Port vineyards are graded from “A” to “F” on quality). Their modern main winery at São Martinho da Anta is constantly being improved and re-equipped. Down in Vila Nova de Gaia, at the mouth of the Douro where the Port houses have their cellars, Cálem dominates the waterfront with an imposing building and much visited facilities. It would seem therefore that Cálem has been – in some areas at least – something of an “under-achiever” over the past few decades. One senses that this knowledge is the real driving force behind Rogério’s passion: he is painfully aware of Cálem’s shortcomings, yet at the same time is fiercely proud of Cálem’s fundamental quality. More than anything, he is utterly convinced that the foundations of the house are solid. He sees a far-reaching investment strategy and some subtle changes to winemaking practices as the moves which will add consistency to the top-end quality of the wines of Cálem. Indeed change is a key word at Cálem, and is evident wherever you look around the operation. Down at the cellars in Gaia, the quayside in front of the Cálem HQ is being extensively and beautifully restored. Inside the atmospheric cellars (where Cálem welcome over 100,000 visitors per year) a tonnelier works away on traditional tools refurbishing barrels, signs on the wall mark the height of flood waters through the centuries and the massive, sleeping casks of Port wine fill the air with heady fragrance. Yet even here there is change, with brand new offices bristling with hi-tech communications, a bottling plant where new packaging ideas are being tested and a quiet murmer of confident activity. 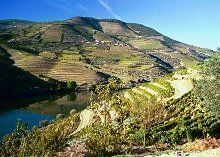 But it is in the vineyards and winery 100 miles up the Douro river that the most significant chages are taking place. 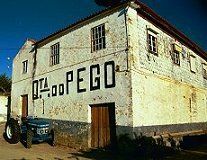 Principal amongst those changes is the recent purchase of the Quinta do Pego, one of the most illustrious and highest-quality quintas in the region. Most of the 20 hectares of gnarled, grey vines in the property are around 80 years old, planted on the ancient terraces, retained by dry-stone walls made of the schistous rock from which the terraces were carved. Rogério has an extensive programme of planting underway. To be more precise, he has a programme of construction and planting underway: new terraces are being hewn from the rock in every nook and cranny of the property that is not already planted. These are Patamares; broader than the ancient terraces and supporting several rows of vines that can be worked more easily. He hopes to increase the area under vine to 40 hectares.Rogério is keen to develop more of his own vineyard land, where he can guarantee quality and price stability for the fruit. As in almost all Port houses, Cálem buy their grapes from a family of growers who work the land of the Douro. Rogério is sensitive to the fact that livelihoods, a way of life and the rural economy is delicately balanced in the region. 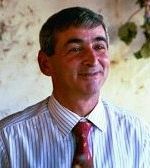 He declares that he would never wish to own 100%, or even 50% of the vineyards that he needs, but just enough to offer finer control of quality and price. He is determined to support the farmers by continuing to buy the bulk of his fruit from them as long as the quality is right. Indeed, Rogério is acutely aware of heritage and tradition in the region. He shakes his head and mutters under his breath as we pass the huge, slab-like modern cellars of a rival company that sit like an ugly scar on the face of one of the most beautiful vistas down the valley. “You see the roof?” he says with a shrug, “It should never have been allowed”. The roof is covered with black tiles, whereas every other roof I can sweeping down the rural Douro has the soft, mellow tones of teracotta. He is about to begin a complete rebuilding of the old farmhouse at his own Quinta do Pego, removing the layers of whitewashed stucco to reveal the original schist construction. He is hoping to restore the small chapel on the site and at the same time transform the interior into a luxurious lodge, which will sit in harmony with its surroundings. He is also restoring the ancient lagars beneath the quinta: the stone vats where grapes have traditionally been trodden by foot. This is how the grapes from Pego will be pressed in future. The next day we drive to the winery at São Martinho da Anta, up the steep road that follows the Rio Pinhão from its confluence with the Douro. This offers some of the most beautiful vistas of any wine region. Here is the final and most obvious proof of Rogério’s vision. Brand new pressing machines and fermentation tanks are in place whilst construction work goes on all around to house them. Rogério makes call after call on his mobile phone to hurry along the delivery of yet more new equipment and, between calls, points out details of the operation that he is in the process of changing. I tasted extensively through the Port wines of Cálem on this vist: the nutty and lemony white Port (for which I developed quite a taste as an aperitif); the solid and well-made basic ruby; the wonderfully complex aged Tawnies and the gorgeous old Colhietas. I also drank several bottles of their rather good Touriga Nacional red wine and was impressed overall by what I tasted. Though perhaps lacking quite the level of complexity one would hope for, the 1983 Vintage Cálem was also a delicious wine. It seems there is absolutely no reason to doubt that the already fine wines of this venerable house will be well worth watching given the vision, determination and obvious pride that Rogério has for his beloved Cálem. Indeed, that revival is already underway it seems: the 1997 Vintage Port recently scooping a gold medal at the International Wine Challenge and a fist-full of other Cálem wines picking up silver or bronze. With the substantial investment and Rogério’s obsession with quality, it will be fascinating to see how the house of Cálem fares over coming decades. This is certainly a name for Port lovers to watch with keen interest.